There's a very good reason why "Sleeping Beauty" villainess Maleficent (Angelina Jolie) got her own movie: She's one of the most iconic villains, not only in the history of Walt Disney animated films, but in all of movie history. But how do the other Disney villains stack up? There are literally hundreds of other baddies in Disney canon, so we’ve narrowed the list down to 12 of the most famous and recognizable villains created by the studio and ranked them from worst to best. While Monstro - the enormous whale who swallows Geppetto and company in the 1940 animated classic “Pinocchio” - is easily one of the most fearsome creatures ever animated by Disney, is it really fair to call him a villain? Although it’s never clearly stated, “Pinocchio” takes place around the turn of the 20th century, at a time when commercial whaling was at an all-time high. Having likely seen his kind nearly hunted to extinction, the whale is no doubt extremely wary of humans (and marionettes who resemble humans) and probably considers swallowing our heroes nothing more than an act of self-defence. Arrogant, entitled, and completely self-obsessed, “Beauty and the Beast” baddie Gaston thinks he’s God’s gift to women and the world. After his many marriage proposals rebuffed by Belle, the Frenchman becomes obsessed with her. Gaston earns serious villain points for not only being a huge jerk, but for also trying to blackmail Belle into marrying him (threatening to have her father committed to an insane asylum) and for leading a mob to kill Beast. Magic mirror on the wall, who’s one of the most feared Disney villains of all? One of the earliest big screen villains from the House of Mouse, the Evil Queen from “Snow White and the Seven Dwarfs” is an insanely jealous and vain monarch who turns to dark magic to snuff out her rival Snow White. The Evil Queen would rank higher on the list, but her rather lame death (being chased off a cliff by a group of angry dwarfs) counts against her. The enormous winged demon at the centre of “Fantasia's” famed “Night on Bald Mountain” sequence, Chernabog is easily one of the scariest and most recognizable Disney villains ever. Summoning ghosts and other evil spirits to haunt the village in the shadow of Bald Mountain, Chernobog’s nighttime reign of terror is cut short by the dawn, forcing him to retreat back into his mountainous hiding place. The iconic baddie loses villain points for his apparent allergy to sunlight. Disney sure likes their evil queens, don’t they? The ruler of Wonderland, the Queen of Hearts is characterized by her dangerous mood swings and fondness for croquet and beheadings. The Queen’s immediate solution to most problems is to order the offending party to be decapitated. Though never taken quite as seriously as other Disney antagonists, the Queen is not one to be trifled with -- as Alice and her friends find out the hard way. The most high-profile male villain from the golden age of Disney animated films, “Peter Pan's” James Bartholomew Hook is a pirate captain determined to exact his revenge on the title character - the flying, ageless child who severed Hook's left hand and fed it to a crocodile. Kind of makes you wonder who the real villain of “Peter Pan” is, eh? Hook is foiled at every turn by Pan, his dim-witted henchman Smee, and still-angry crocodile. If there’s a string to be pulled in the Kingdom of Agrabah, it’s more than likely that Royal Vizier Jafar is the one pulling it. The tall and wiry antagonist of 1993’s “Aladdin” is one of the most manipulative and scheming villains ever put on screen by Disney. He’ll stop at nothing to become ruler of Agrabah and get his hands on the magic lamp. For being one of the few Disney evildoers to ever return (albeit in a direct-to-video sequel), Jafar gets high villain marks. The youngest of 13 siblings, “Frozen” villain Prince Hans was twelfth in line to the throne of the Southern Isles. With no hope of ever being king in his homeland, Hans devised a plan to become king of Arrendelle by wooing Anna and murdering her sister Elsa. It’s a truly devious plot that is thankfully foiled by the two sisters. Hans comes in fifth place on this list for being a Disney villain in sheep’s clothing: a handsome prince turned murderous schemer. As this list illustrates, there are plenty of downright evil villains in the Disney animated pantheon. But is there any Disney villain worse than “101 Dalmatians” antagonist Cruella De Vil? The fashion-obsessed heiress ranks very highly here due to her apparently insatiable desire to kill 99 adorable puppies so she can turn them into a fur coat. Pure. Evil. Younger brother of Mufasa and uncle to Simba, Scar is a power hungry lion who, in true Shakespearean fashion, betrays and murders his older sibling in order to become King of the Pride Lands. Appropriately voiced by English thespian Jeremy Irons, Scar stands out as one of Disney's most iconic baddies. One of the most recognizable movie villains ever, Maleficent is an evil fairy with an extremely potent arsenal of magic at her disposal, including the ability to transform into a giant dragon. She’s also responsible for putting the titular sleeping curse on Princess Aurora in both “Sleeping Beauty” and “Maleficent.” Her apparently evil motivations are explored in the latter film, where she is played by Angelina Jolie. Maleficent earns the top spot on the list not only for being extremely powerful, but for also being the only Disney villain to ever make the jump from animation to live-action. Got a favourite villain who didn't make the cut? Let us know who you think the greatest Disney villain of them all is in the comments. 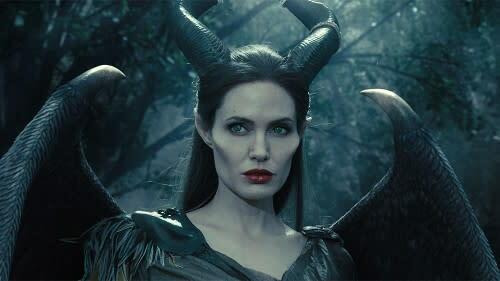 "Maleficent" arrives in theatres on May 30. Photos courtesy of Disney Pictures.